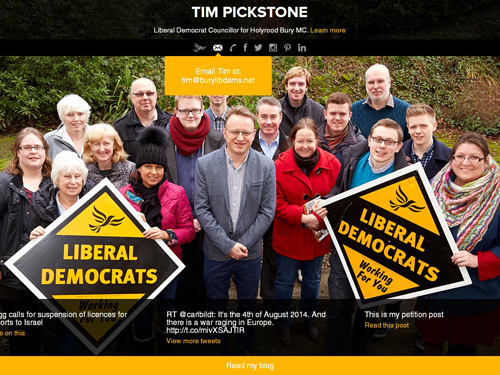 MyCouncillor is ALDC’s member-only website platform. We launched it in 2008 and it has given our members a great head-start in online campaigning. We now need to update the system. This will affect all the current sites, but it will also make the system easier for all our members to take advantage of. Most people look at sites like these on mobile devices which our current sites do not cater for. The rise of social media in particular has outpaced the development of our sites. We need to update urgently, to make sure that our websites meet the minimum expectations of our visitors. We want to make the sites easier for users to maintain and give you a choice between a regularly updated ‘blog’ or a simple clean online ‘business card’. Our current Themes are fairly tired and we want to bring all of our sites up-to-date with the internet today and also the Party’s new style guidelines. What will the new sites offer? Blog if you want to! Posting regular local stories onto your site, and directing readers towards them, is the best way to get the maximum value from your site. The new sites will offer the same functionality. For users who do not want to blog, we are going to offer a ‘basic’ (i.e. no added extras) site, pictured above. The basic sites are nicely-designed sites with minimal contact details (and a simple picture, if you wish) that will function as an online business card for people who want to find you. Unlike in the current system, the sites will not quickly look outdated with old posts hovering at the top of the page. The basic sites will be low-maintenance and will keep the appearance of your site current and professional. All sites will keep automatically up-to-date with the latest national news stories and you can choose to add your own local news, or your own Twitter feed to keep the site looking fresh every day. Everyone can link through to their social media – Facebook, Twitter and lots more. The plan is to roll out the changes to the MyCouncillor system to all users in September 2014. We will be helping everyone with the changes to ensure this happens smoothly. If you’re someone who hasn’t used MyCouncillor for a while then the new sites will be a great opportunity to get going again and we will help you do this. Please do not hesitate to get in touch now if you have any queries, comment, ideas or concerns. We will be contacting members with more information on the (minimal) changes to the admin area of the site and with details of the transition to the new structure in the next few weeks. My site is running fine but I am looking into changing it to our local ward site. Do I need to restart the design or can it just be renamed.